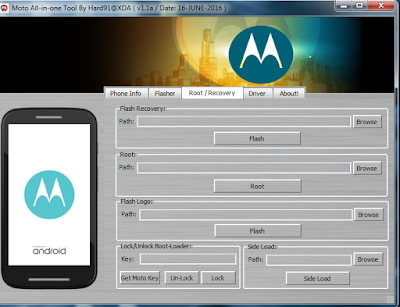 Hi GSM Friends today i'm going to share with you Motorola all in flash tool By Hardeep Singh from xdadeveloper, to make software repairs on Device motorola smartphone. 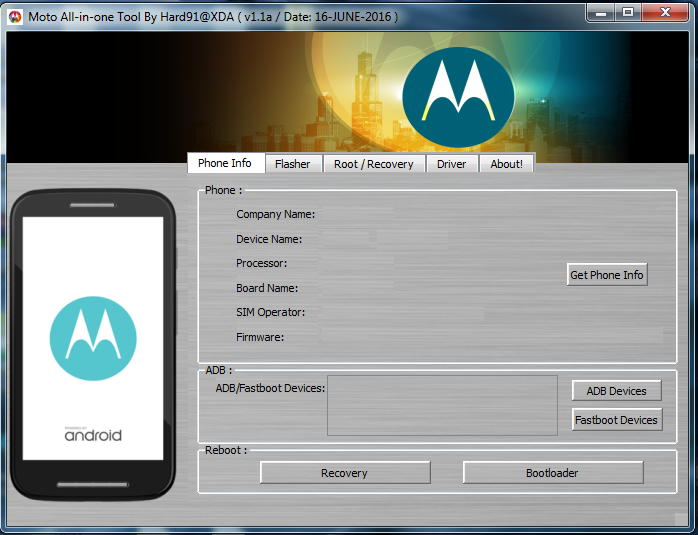 you can use this to for all motorola android device , you use this tool for Read Info , Flash stock /coustom recovery, Root motorola device, to lock bootloader, to unlock bootloader, to get unlock bootloader key, to remove bootloader warning, overall this is great tool for motorola device, download here this tool provided Direct link below and install in on your Windows, run this tool Before using this tool, read all instruction given here. Flashing rom stock for smartphone smartphone Motorola. Flashing logo.bin to remove bootloader warningMessage. Sideload any zip / ROM. Installing ADB & mfastboot driver. NOTE: Please note that all the MOTO Models do not support unlocking bootloader like phones under AT &T and other contract phone, Hence this tool can only automate the adb commands that are used to get bootloader string and unlock bootloader. This tool will not do any kind of magic to unlock your contract Moto device.